Abstract: Biology has traditionally defined individuals by the criteria of anatomy (organisms separated from the environment), physiology (organisms whose parts work toward a common end), development (organisms derived from a common precursor cell), genetics (autopoietic organisms whose cells contain the same genome), immunology (organisms that reject non-self), and evolution (that which is selected). Recent studies show that symbiosis, rather than being an exception to the rule, is the rule. A new mode of individuality, the holobiont, has been proposed, consisting of the larger organism and its persistent colonies of symbionts. The holobiont is a multi-lineage organism whose cells function through co-metabolic pathways, whose development integrates the life cycles of several species, and whose phenotype often depends on alleles found in both “host” and symbionts. Natural selection, then, may select for consortia, or teams, of species, and the tree of life may be more like real (i.e., holobiont) trees than we had thought. Birth is more than the generation of a new individual. It also concerns the continuity of the communities. The ramifications of this new view of co-dependent life where “becoming with the other” may be as important as “survival of the fittest” will be examined. 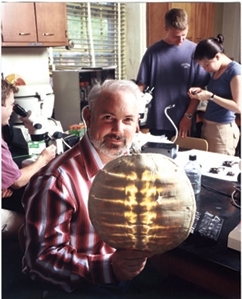 Scott F. Gilbert is the Howard A. Schneiderman Professor of Biology at Swarthmore, where he teaches developmental genetics, embryology, and the history and critiques of biology. He received his B.A. in both biology and religion from Wesleyan University (1971), and he earned his Ph.D. in biology from the pediatric genetics laboratory of Dr. Barbara Migeon at the Johns Hopkins University (1976). His M.A. in the history of science, also from Johns Hopkins, was done under the supervision of Donna Haraway. Gilbert currently has three books in print: Developmental Biology (a textbook in its tenth edition), Bioethics and the New Embryology (a volume, co-authored with two students, that discusses new findings in developmental biology with respect to philosophy and religion), and Ecological Developmental Biology (a textbook co- authored with David Epel which integrates developmental plasticity, epigenetics, and symbiosis into discussions of medicine and evolution).